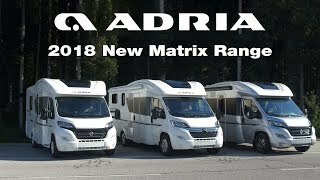 Adria Comprex construction with white body and additional headroom inside. New Tempo Brown interior design with choice of textiles. Electrical pull-down front bed integrated into sleekly designed roof space. Spacious kitchen with large fridge, grill and oven, 3 large burner hob, stainless steel sink, drainer and LED lined window. The model has metallic paint, luxury pack which includes Hi Level radio with Sat Nav & DAB, rear view camera, roof rack & essentials pack, bike rack. Externally the Matrix has a new profile, lowered at the front and raised at the rear to offer more headroom inside. An ADAC safety-award winner, made in Adria’s unique Comprex body construction and now with a new rear wall design with horizontal lights. 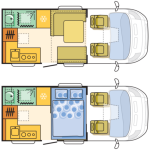 The Matrix sets a new benchmark for crossover motorhomes, with optimised space, contemporary interior designs and layouts. From the large lounge dinette, to the large kitchen, spacious ‘hotel style’ washroom and comfortable bedrooms, the new Matrix offers unparalleled versatility on the move.